My name is Tina Walker and I am super thrilled to be here with you today! I will be sharing 2 StencilGirl projects with you, a bright, colorful, and graphic art journal page, and a trio of ATC cards created with a stencil created mold. Hopefully a little something for everyone! Up first, I'd like to talk about my super funky and colorful art journal page. I am a 'everything including the kitchen sink' creative. I love creating art journal pages, fabric mini books and weavings, assemblage art, and the traditional scrapbook page. 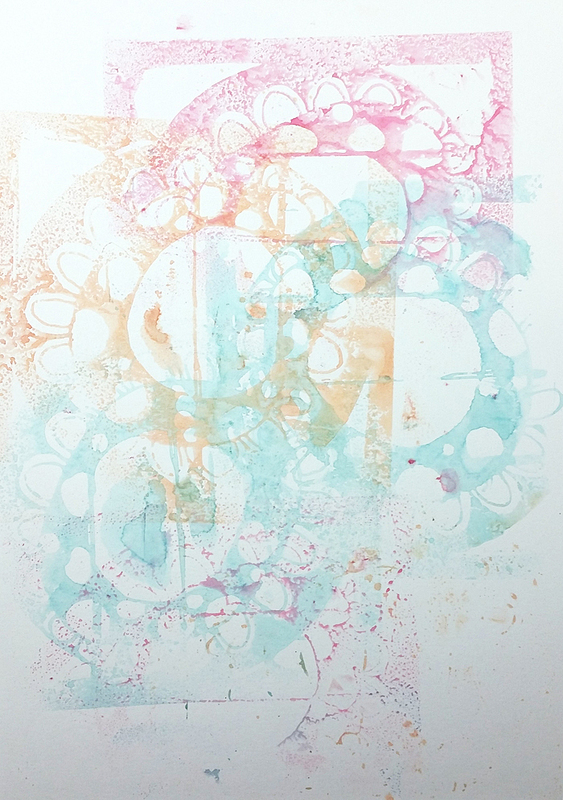 I noticed a few months ago that my color palette varies with the type of project I create. I'm not sure why, but I noticed that my art journal pages are usually very colorful, full of graphic lines and details, and usually incorporate some type of doodling. When I saw the City Encompassed stencil, I just know I had to have it! This page started like many of my art journal pages start, with a 'paint off' or should we say a 'stencil off'. 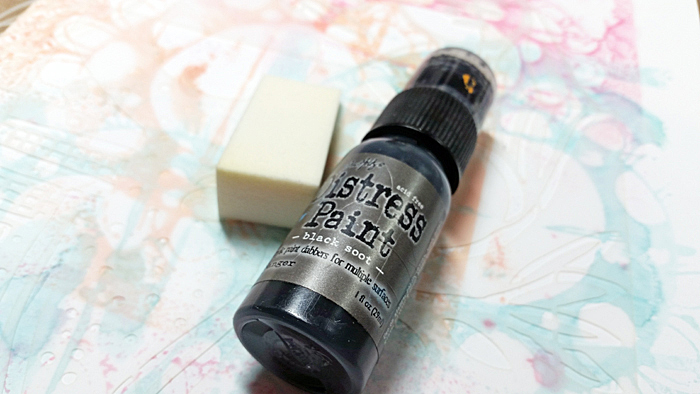 These 'off' pages are where I wipe off my paint or spray mist from another project and often have multiple layers from several projects. Here's a picture of my 'off' page. 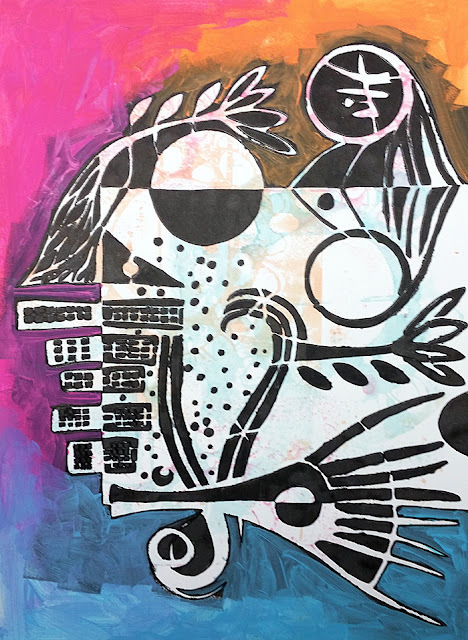 From this page, I added more layers of paint, stenciling, and doodling to create a finished art journal page. I grabbed a makeup sponge (great for adding paint on intricate stencils), black acrylic paint, and the City Encompassed stencil. You can see the edges are a bit rough, but no worries! I'll outline with a black pen and they are like new! 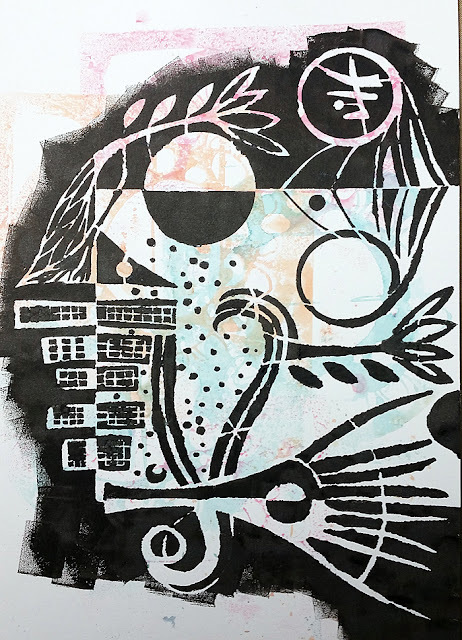 Next, I grabbed some Heavy Body acrylic paint and painted around the outer edge of the stenciled image, letting the paint mix where they met. 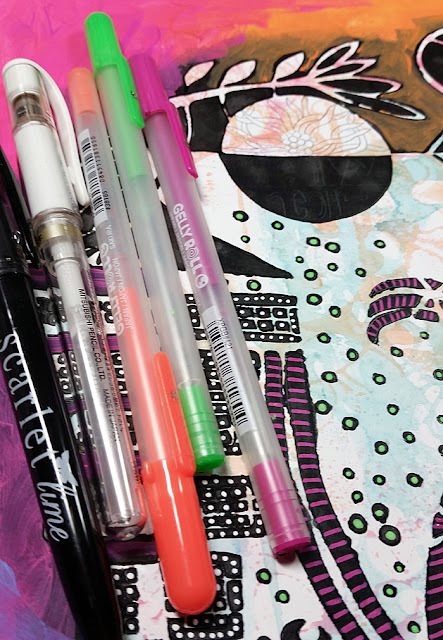 You could finish here with just some journaling and/or words, but I love to add my own personal touch, so I added more doodling to the image with Gelly Roll Pens and my fave black and white pens. You can see that my handmade doodles really made the page unique, one of a kind, and totally me! Here's some close-ups of the details. 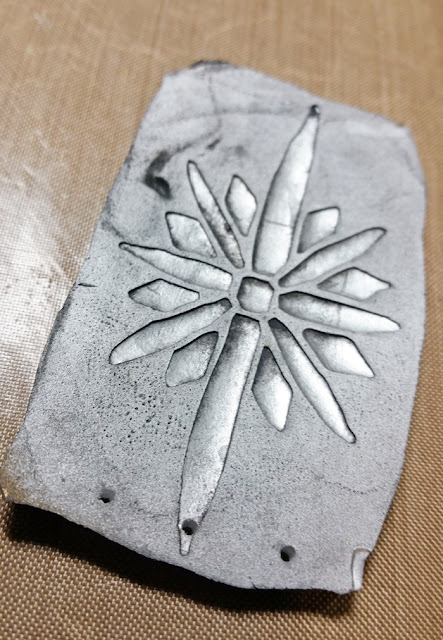 For my second project, I would like to show you how to use your stencils to create custom made mold and resin casts. I am a mold/resin addict. I am constantly looking for ways to make molds and resin casts of vintage found items and everyday objects. 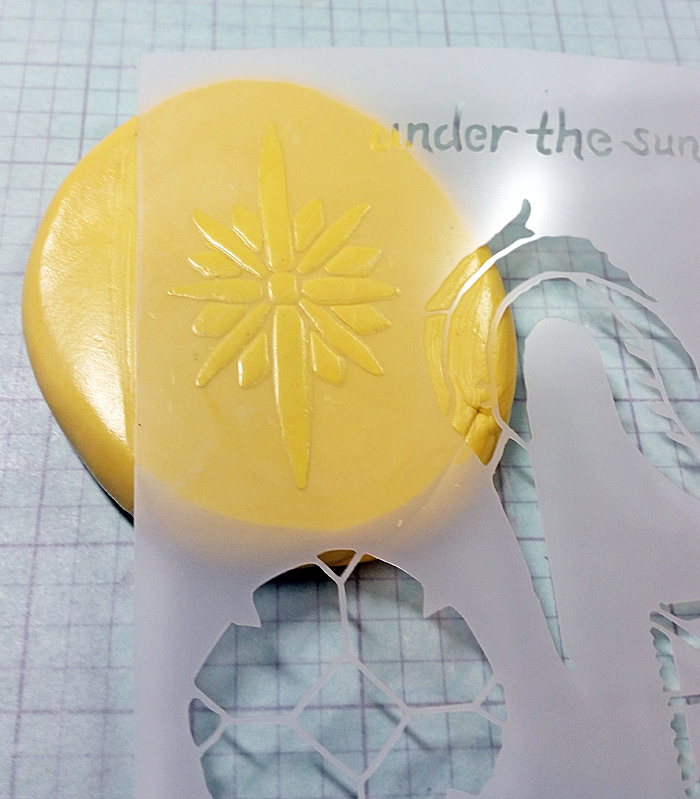 I got my brain wheels turning and wondered if I would be able to create a mold from a stencil! And the answer is YES! Here's how! 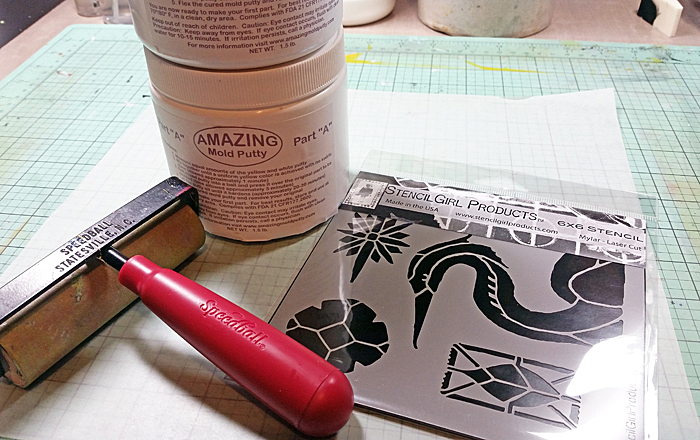 Grab some mold putty (I use Amazing Crafting Products), a brayer, and your favorite StencilGirl stencil. 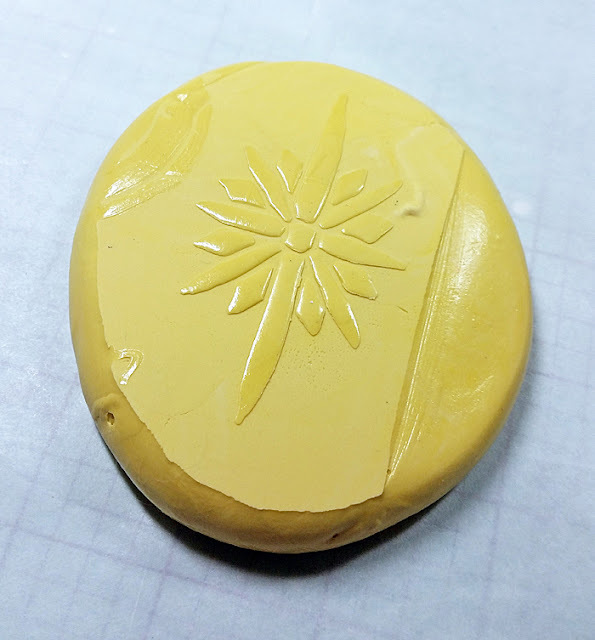 Mix the mold putty as directed and place the stencil on the putty. Brayer evenly over the stencil, gently pushing the stencil into the putty. Allow to set per the manufacturers instructions, then remove the stencil. Before I added the resin, I 'painted' the mold with metallic powder so I wouldn't have to paint the finished pieces. 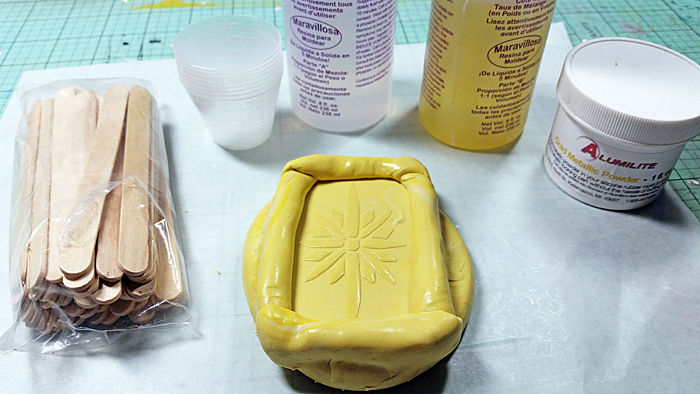 Mix the resin (I also use Amazing Crafting Products resin) per the manufacturers instructions and add to the mold. Allow to set as directed. Once the resin has set, remove from the mold. The next day, when the resin had completely hardened, I drilled 3 small holes at the bottom of each piece and added bling. 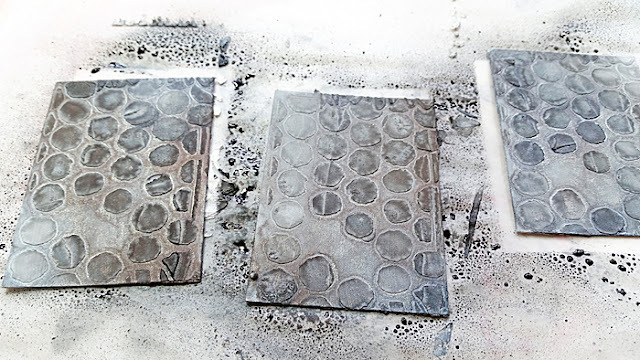 To create the background of each ATC card, I applied modeling paste with a portion of another stencil, then sprayed liberally with spray mist. I tend to create ATC cards in three's, so I used coordinating metallic colors for each card for a cohesive look. To finish them off, I embellished each card with more resin casts, metallic findings, and stitching. Here's a peek at the details. Thank you for taking the time to stop by! And a special Thank You to StencilGirl for letting me share with y'all today! Wow Tina, what a great post! I love how you doodled to make the desighn your own! And the molding idea is really cool! Love your style(s). Very cool Tina. Love the way you used the stencils as a journal page start. I never knew you could use a stencil to make a mold, thanks for showing this. You are so creative, Tina! Wonderful art! 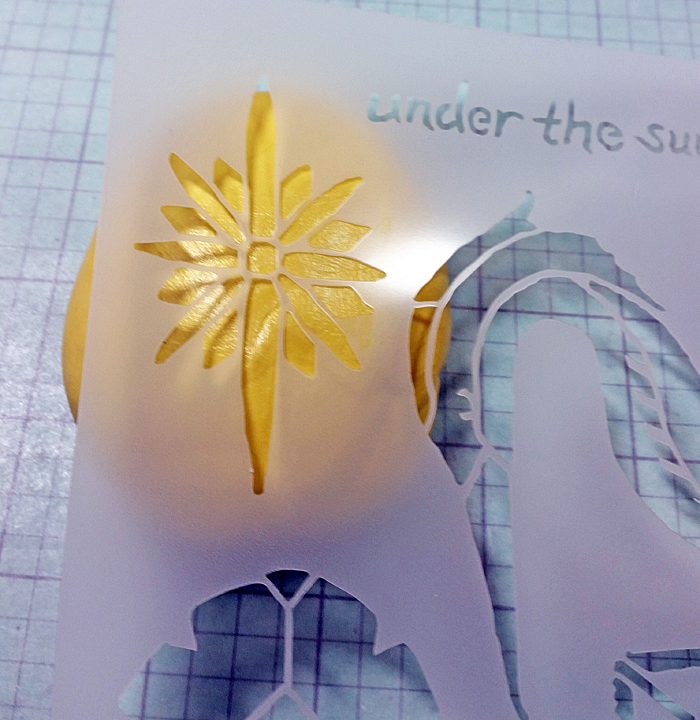 Always a joy to see how you utilize stencils in such a different and totally cool way! 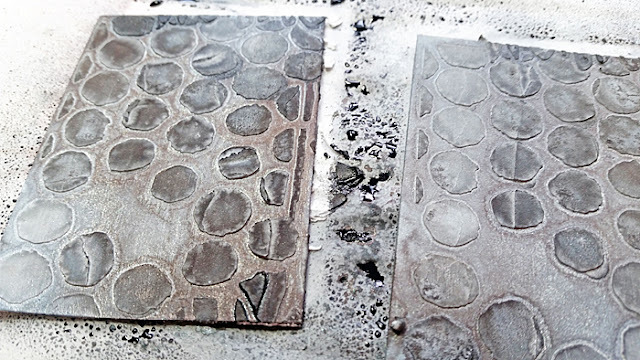 Great stencil projects! I recently bought some Amazing resin, and resisted getting the molding putty. Big mistake! Can't wait to try this. I love these pieces! Thanks so much for sharing your great ideas.